Hex head sheet metal screw with washer. 4.8 x 16mm. If this is not the exact Hex Head Sheet Metal Screw (w/ Washer) you are looking for, or you would like this part in a brand other than Genuine BMW, please contact us and one of our customer service experts will help you locate the exact part you need. eEuroparts.com® proudly offers wholesale prices and fast shipping available on most orders. 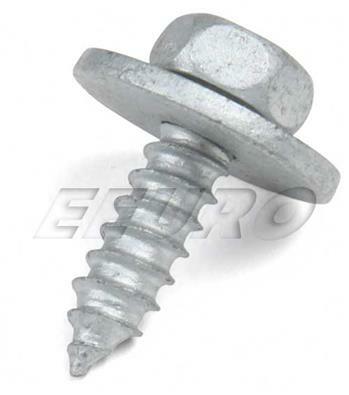 We also provide inexpensive and guaranteed 3 day, 2 day, and Overnight shipping options, so if you need your Hex Head Sheet Metal Screw (w/ Washer) tomorrow, eEuroparts.com® can deliver! Every eEuroparts.com® order is track-able, meaning you'll know exactly where your Hex Head Sheet Metal Screw (w/ Washer) is at every step of the shipping process. eEuroparts.com® also displays your Expected Ship Date and transit time in your Cart, making our entire shipping process simple and transparent.